He went on to cite several industry leaders and their companies who are reimagining the business — Doug McMillon and Walmart; Brian Cornell and Target; Miki Racine Berardelli and KidBox; Greg Sandfort and Tractor Supply Co.; Jeff Gennette and Macy’s; Marla Beck and Bluemercury. One such pairing that would be right at home on the list is Rodney McMullen and Kroger. Not all that long ago the nation’s biggest operator of traditional supermarkets was a conservative organization, content to chalk up quarter after quarter of comparable-store sales increases and expand via the tried-and-true method of acquiring other grocery chains. That situation has changed considerably since the company in October 2017 launched Restock Kroger, an initiative designed to do nothing less than redefine the food shopping experience in this country. The company has moved with impressive alacrity to deliver on that promise, forging partnerships with technology providers and other retailers to accelerate its evolution. McMullen took the stage at the Big Show on the same morning that Baldwin spoke to provide an update on Kroger’s progress on the ambitious journey it has ­undertaken. 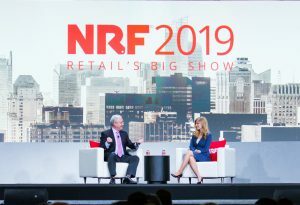 Kroger chairman and CEO Rodney McMullen delivers a keynote presentation moderated by CNBC anchor Sara Eisen at NRF 2019: Retail’s Big Show in New York City. “Our vision is to serve America through food inspiration and uplift,” he said. “We’re transforming Kroger from a grocery company to a growth company.” In order to do so, Kroger must enlarge the scope of its vision and invest in new capabilities, including the skill set of its store associates. Equipping Kroger to compete effectively in the new marketplace requires a new business model, one that seamlessly melds the retailer’s existing strengths in the brick-and-mortar world with a growing range of digital tools. McMullen reminded his listeners that the task can’t be completed overnight. To satisfy the expectations of omnichannel shoppers, Kroger is moving to expand its own ample expertise and robust resources in food and the grocery business, with the complementary assets of such partners as Ocado, Microsoft and Walgreens Boots Alliance. Kroger and Ocado, one of the world’s biggest online food retailers, are working to bring the latter company’s proprietary technology to a series of distribution centers that will power the former’s e-commerce business in the U.S. The first of the facilities, a 335,000-square-foot warehouse costing $55 million, is under construction in Monroe, Ohio, close to Kroger headquarters in Cincinnati. McMullen told Big Show attendees that the sites of the next two DCs will be announced in the near future, adding that, if it had developed them on its own, it would have taken Kroger five to 10 years to match the capabilities that Ocado is providing. A new partnership with Microsoft will similarly give Kroger quick access to tools that it — or any traditional retailer — would be hard pressed to create. McMullen said that representatives of the two companies identified opportunities where they could help each other, including the ability to curate the retail experience for the supermarketer’s customers. Under another deal, with WBA, Kroger customers can pick up their grocery orders at 13 Walgreens drug stores in northern Kentucky. In a subsequent extension of the original pilot program, shoppers at those locations can take advantage of Kroger Express, a curated assortment of 2,300 items, while Home Chef Express meal kits are now available at 65 Walgreens stores in greater Chicago. Like National Hockey League great Wayne Gretzky, who famously said that “you have to skate to where the puck is going, not where it has been,” McMullen and Kroger have a clear understanding of what it will take to stay at least one step ahead of the competition.